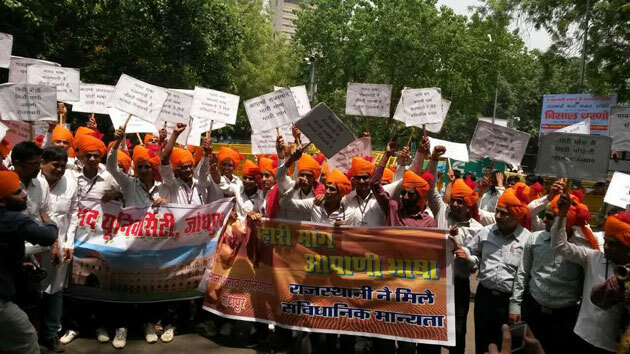 In a sharp effort to step pressure on the Narendra Modi government, protagonists of those seeking to insert Rajasthani language in the eighth schedule of the Constitution have decided to hold a 25,000-strong rally on July 27 in Delhi in favour of their 12-year-old demand. To gather support from the Rajasthani community all over India for the proposed rally, the organizers of the rally began a yatra in Mumbai, reaching Ahmedabad on July 20. Sources said, Union home minister Rajnath Singh has already “agreed” in principle to include Rajasthani in the eighth schedule. If earlier samiti members met him, how samiti members led by chairman of Prof Rajendra Barhat and vice-chairman Vijay Kumar Jain have decided to meet Modi to press for their demand to come up with a during the monsoon session of Parliament. The reason for gathering support from Gujarat, samiti sources say, is particularly important, as there is a “huge cultural affinity” between Rajasthan and Gujarat. Besides, there a large Rajasthani community presence in several of the Gujarat towns. In Ahmedabad alone, there are an estimated 6 lakh Rajasthanis, which comes to around 10 per cent of the city’s population. The plea to include Rajasthani in the eighth schedule of found resounding support of in 2003, when the state assembly passed a unanimous resolution in its favour and sent it to Delhi for consideration. “Ever since then, the issue is under examination. While both, ex-UPA and present NDA government have agreed in principle to the demand, strangely, things have failed to move”, says LN Patel, an Ahmedabad-based chartered accountant who hails from Jodhpur. Awaiting a nod from Delhi, the Vasundhara Raje government in Rajasthan has allowed introduction of Rajasthani in schools in Udaipur, Dungarpur and Banswara districts, where children of class one will be given lessons in local dialects of Rajasthani. While Mewari will be the medium of teaching for students in Udaipur, teachers will communicate in Wagri with the scholars in the other two districts, according to a report. Apart from Rajasthani, the demand has been pending to insert Bhojpuri, too, the eighth schedule of the Constitution, making it an officially recognized language. It finds support from influential quarters in Bihar and Uttar Pradesh, as well as people’s representatives from the two states. Currently, there are 22 languages which have received such official recognition.